Hand in Hand in Damascus (HHD) is an extension and expansion of the LCMCS Helping Hands for the Hungry program which has been operating since spring 2014, delivering weekly fresh produce baskets to 25-40 area senior citizen households that experience decreased access to fresh produce and/or food insecurity issues. HHD is expanding the program to provide healthy meals to citizens in the Damascus area. HHD will provide weekly lunch for up to 30 people on Wednesdays, from 1-2:30 PM at LCMCS, from March 9 through June 29th of this year, with a special luncheon on May 4th. Lunch will include organic or sustainably-raised vegetables, fruits, and proteins, plus a choice of herbal tea or organic cow or oat milk. The lunch will be prepared in the LCMCS kitchen, and served by volunteers and students in the school’s multi-purpose room. After lunch, a presentation or discussion will take place, covering possible topics from aging gracefully, to the history of the area, to personal or home safety and emergency preparedness, to food preparation and senior health information and resources. The lunch will be by open enrollment for program recipients, by registration each week. Volunteers will be needed to meet-greet-seat, serve and clean up for lunches; procure, pack and deliver produce baskets; provide food or presentation information; provide additional transportation; be connectors and clever conversationalists with program participants. Please contact volunteer@lcmcs.org if you are interested in being a part of this fantastic program. Helping Hands for the Hungry is in its second year as a program to help improve access to healthy foods. 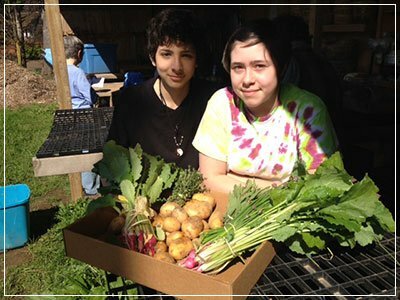 The students at LCMCS grow and distribute free fresh, organically grown produce to seniors in the Boring/Damascus/Sandy areas. Distribution will begin in June and continue weekly through September or October, depending on growing season.